Serving: All of Long Island, Nassau County, Suffolk County , New York, Queens, Brooklyn, Albertson, New Hyde Park, Old Westbury, Oyster Bay, Bethpage, East Meadow, East Norwich, Garden City, Glen Cove, Great Neck, Herricks, Hicksville, Jericho, Roslyn, Roslyn Heights, Seaford, Levittown, Locust Valley, Manhasset, Massapequa, Massapequa Park, Merrick, Plainview, Port Washington, Searingtown, Syosset, Wantagh, Williston Park, Woodbury, Cold Spring Harbor, Dix Hills, Huntington, Melville, Commack, Northport and MANY more! At "What’s Cooking? ", the birthday child is made to feel extra special and the center of attention by our friendly, courteous, and professional staff that caters to ALL of your birthday party needs. We’re all about the experience and we want to make sure your party is memorable, unique and special for all that attend! We host delicious, customized kids baking birthday parties, with activities such as cookie, cupcake, pizza, pretzel, and chocolate making! Bubble Wrap stomping is also a big hit with the kids! Check out our video above! OUR NEWEST BAKING BIRTHDAY PARTY THEME: Cupcake Wars is a HOT new offering at What's Cooking? It's just like on TV! Competitive cupcake making and decorating with an exciting theme is popular with the older children. Another NEW offering is CRAZY CUPCAKES! Bake six crazy tie-dyed cupcakes from scratch and decorate with tie-dyed icing and fun toppings. It's a BLAST! Other awesome themes are Pajama Parties: Come in your pj's and feast on pancakes and waffles at any time- day or night (comes with whipped cream, mini chips and warm syrup) or bagels with cream cheese or butter and be ready to party! Flowerpot Birthday Parties combine crafting and chocolate molding together to make beautiful flowerpot creations. Paint a clay pot and decorate with beautiful chocolate flowers made by your child. What a beautiful and unique goody bag to take home! Baking Birthday Party favors such as personalized chef hats & aprons, mini rolling pins, candy cones and more are also available to complement any birthday party. *An extensive adult menu is offered as well. Looking for an exciting new Baking Birthday Party place for your child’s next birthday celebration? At “What’s Cooking?” we offer a unique baking birthday party place and culinary school located in Long Island. We host delicious baking birthday parties that include cookie, cupcake, pretzel, pizza, and chocolate making. 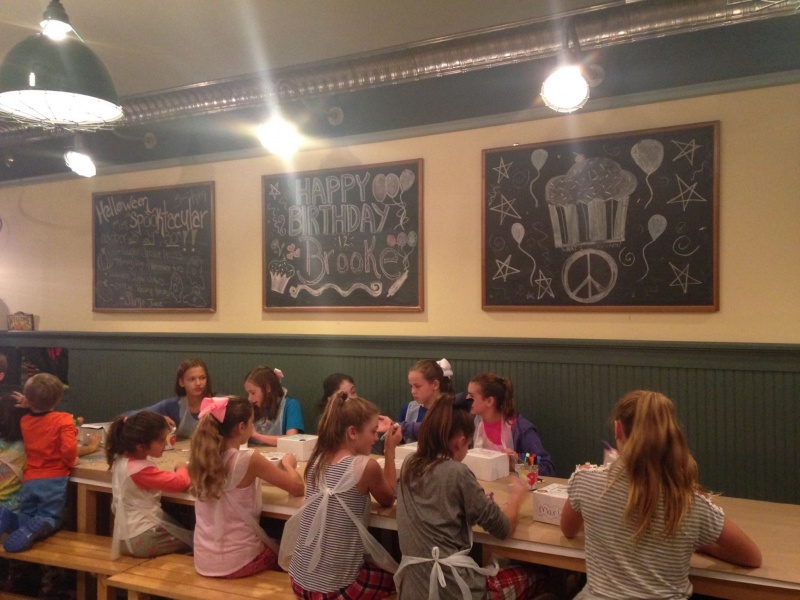 Our HOT NEW theme “Cupcake Wars” is very popular with the older kids! It’s just like the Food Network show! With amazing themed toppings and colored icings to decorate with, your child will have an absolute BLAST with his or her friends! 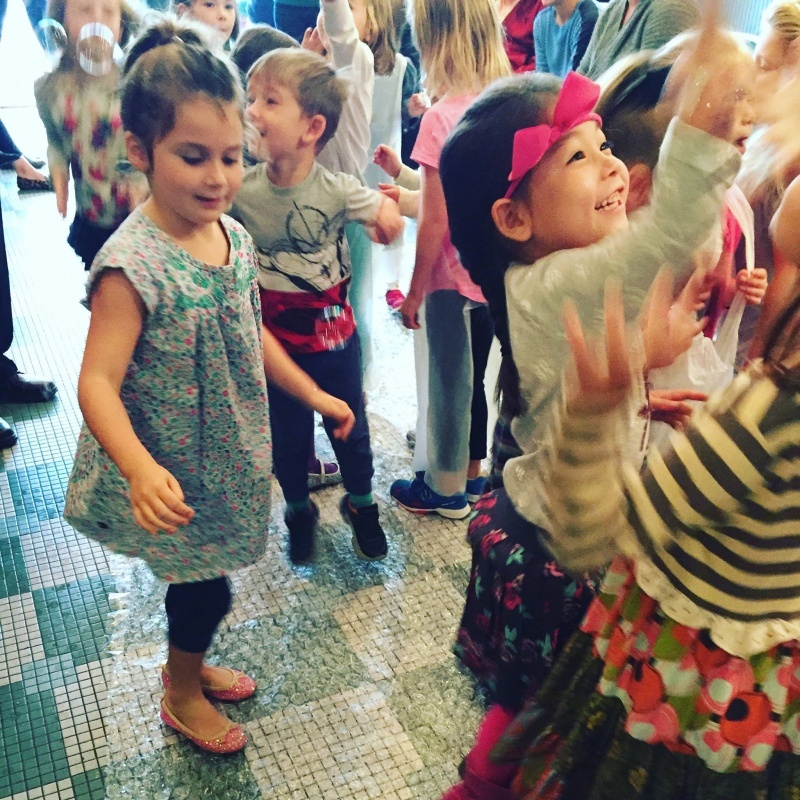 We do fun and engaging birthday parties for children as young at two years old! Martha Stewart, Newsday and News 12 have all featured “What’s Cooking?” as a #1 choice for baking birthday parties on Long Island, serving Nassau, Suffolk, and Queens. At “What’s Cooking”, kids can explore their creativity in the culinary arts in so many ways. We offer a wide variety of birthday party themes and classes in our spacious party room, and exceed customer’s expectations with our superior service and value. Your child’s FUN-tastic baking birthday party can be customized with a sundae and candy bar, bubble wrap stomping or chocolate fountains, making any birthday party memorable! At What's Cooking, children will enhance math skills by measuring solids and liquids, science by observing how temperature changes the properties of food; Colors and shapes by describing and naming foods and cooking equipment and language, culture and customs by learning about different societies, nationalities and ethnicities and what holidays are celebrated. We offer Junior Chef cooking classes and baking classes, as well as a Junior Chef Club, for ages 4-7. 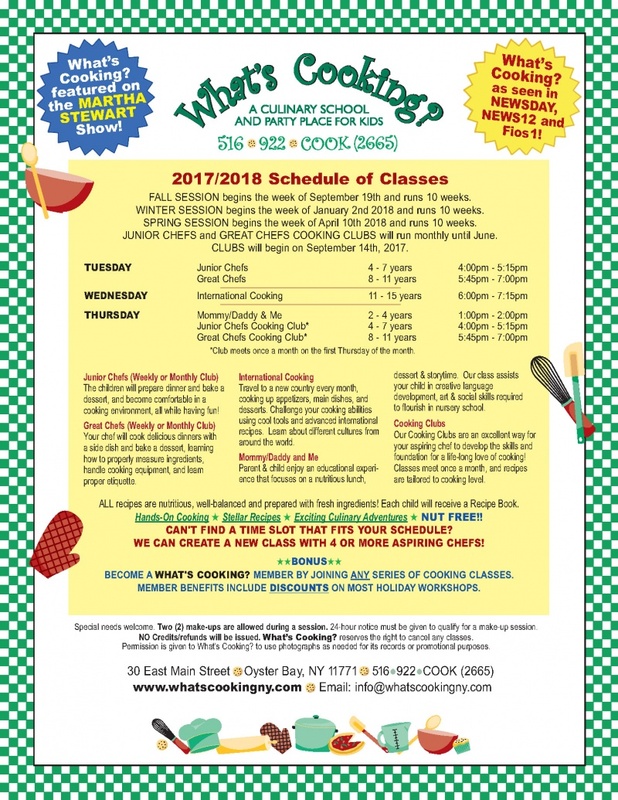 These cooking classes and baking classes are available weekly or monthly. Children will cook an entree and side dish, as well as bake a dessert. Our goal is for children to be comfortable in a cooking and baking environment while trying new foods. Our Great Chefs cooking and baking class is the next step in our cooking curriculum. Children, ages 8-11, will learn to follow and complete recipes, properly measure ingredients, be comfortable handling sophisticated cooking and baking equipment such as stand mixers, food processors, graters, knives and learn proper etiquette. Our International Cooking Club is for children ages 11-15. Travel to a new country each week, cooking up appetizers, main dishes and baking a dessert. It is here your child will learn about different cultures, nationalities and ethnicities. Cheapest way to travel the Globe! Children will also learn basic social skills by working with other children and ultimately leave What's Cooking? with a higher level of self confidence and self-esteem. However, the greatest aspect about teaching children to cook and bake is that they have FUN! **BONUS**Become a What's Cooking? member by joining any series of Cooking Classes. Member benefits include DISCOUNTS on most Holiday Workshops. ALL recipes are nutritious, well-balanced and prepared with fresh ingredients. Each child will receive a Recipe Book filled with the delicious menus they have cooked and baked. All classes are totally hands on with stellar recipes that are nut free. Mommy/Daddy & Me for the little ones! Cooking and baking is a true opportunity for quality time and bonding. And along with the significant emotional benefits, the external benefits are enormous. You can practice improving fine motor skills, counting, sharing, patience and communication all while cooking and baking. Plus, cooking and baking a variety of foods encourages toddlers to try different foods. Cooking with colors, shapes and numbers familiarizes your child with the fundamental building blocks inherent for success in today's early educational system. Your child will spend one hour each week learning various colors, shapes and numbers through recipes that are focused on cooking and baking all sorts of fun-filled pastries, pies, quiches, paninis, lasagna rolls, mac n' cheese etc. Furthermore, children enrolled in this class will learn to socialize with other children in a group environment securely expressing their individual characteristics. What's Cooking? has hosted various and numerous groups of special needs children, teenagers and adults. We have a special bond with our AHRC self sustained group homes in many areas including Brookville, Old Westbury, Bayville, Plainview, Massapequa and East Norwich. Over the years, What's Cooking? has held a number of cooking and baking events for "Medals for Mettle", the Long Island Chapter cancer group for children. We have hosted Wounded Warriors Project, GAP Programs and numerous parties for our special needs chefs. 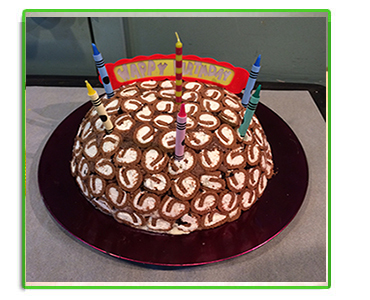 Birthday parties are customized as well as our cooking classes, tailored to individual cooking abilities. Our staff is courteous, friendly and patient. We enjoy putting a happy face on all who participate in our cooking and baking parties, classes or events at our facility. When children or adults master skills and are so proud of their accomplishments, we are delighted! And best of all, our special chefs have the opportunity to taste and eat a delicious meal that they have prepared. Along with the benefits of raising self-esteem and improving fine motor skills, communication is developed through socialization in a group environment. Check out ALL of our holiday events coming up on our website! You can also follow us on Facebook to view all our birthday party, class, and special event videos and pictures!!! Call in today (516) 922-2665 to join our mailing list to receive discounts and a heads up on all our promotions throughout the year! Contact Me About What's Cooking?